The World Economic Forum (WEF) has recognized Javier Garcia Martinez as one of the 2009 Young Global Leaders for his pioneering work in nanotechnology and energy, his leadership, and his commitment to shaping a more sustainable global future. Martinez is a titular member on the IUPAC Inorganic Chemistry Division and associate on the Committee on Chemistry Education. Each year, WEF recognizes distinguished young leaders below the age of 40 from around the world. This year, 230 individuals, including Javier Garcia Martinez, were selected from a pool of almost 5000 candidates. 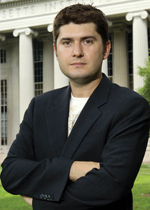 In 2005, Javier cofounded Rive Technology, Inc., to commercialize the technology that he developed during his post-doctoral stay at MIT. The technology is a proprietary method of modifying the pore structure of a zeolite, making it more accessible to larger molecules in a feedstock. Rive selectively introduces mesopores (pores nearly four nanometers in diameter) into a zeolite, allowing larger molecules to access the zeolite and get “cracked” into valuable products. As a result, petroleum refiners obtain a higher yield of desirable products such as gasoline, diesel fuel, and propylene, and less of undesirable products like heavy cycle oil and coke. Rive was recently honored with AlwaysOn’s GoingGreen East 50 award for the disruptive potential of its catalyst technology as a cleantech solution. Javier received his BS, MS, and Ph.D. in chemistry at the University of Alicante, Spain, where he currently leads the Laboratory of Molecular Nanotechnology.